I purchased the PIXEL TC-252 specifically for the Great Eclipse of 2017. 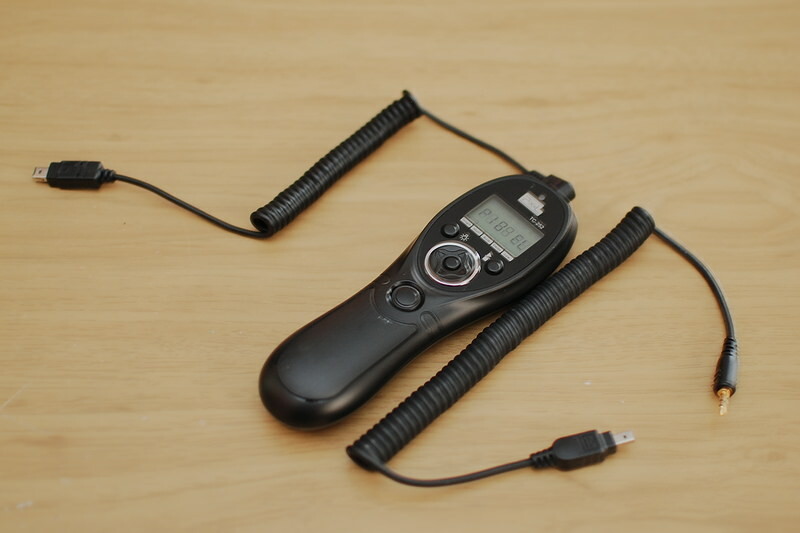 It is a unique tool and I continue to use it as my remote shutter release. I bought a version with a Nikon D80 interface cable (and they are interchangeable) to do a time-lapse series. I also picked up a D7000 interface cable so I had the option of using it with the main camera, even though the D7000 has a built-in intervalometer for time-lapse work. This remote control does much more though. Forgive the motion bluring, I discovered after this photo I had dirt in my hotshoe and it caused problems with my camera talking to my speedlight. It does not look remarkable since camera bodies generally have these features built in. But this all is available with the camera left in single-shot shooting mode (except bulb) and can be changed with the remote in your hand and the display lighted for use in the dark. Kind of handy when the camera body is on tripod and you cannot easily see the buttons on the body in the dark. The remote itself is powered by 2 AAA batteries, and they last a very long time. There is no power switch, it just goes into a sleep mode when not in use. There is a button below that is the shutter-release, and it has a half-press. There is a red-green LED indicator to show half-press focus-lock and full-press activation. Above is a D-pad for programming the functions, a display backlight illumination button, and a play-stop button for activating the intervalometer. Functions can be combined, or you can isolate sub-functions to just use them. For instance, you can take a 2-minute long-exposure in bulb mode and let the remote do the timing, instead of timing manually and holding down the shutter button the entire time. It is not a direct feature, but if you set the timer to 0 time delay, single shot, 0 interval, and 2 minute exposure time setting you get the desired function. And this program sticks so you can sit in the dark and try to capture shooting stars or Aurora lights over a period of time. Actually you can do that with the intervalometer set and just go sit in the warm car and play Candy Crush for a while too. My camera bodies max-out at 30 seconds for a long exposure, so this adds a feature it cannot do on it's own. This remote works equally well with my D80 and D7000. The connector sometimes causes a problem at the remote end if it is not pushed in securely before starting. Letting it dangle free from the camera can sometimes cause the connector to separate slightly too. Admittedly the programming of the timer can be difficult to memorize and the manual comes out for that. There is a pdf version online that can be stored on a smartphone to reference. I picked this up for about $35, then paid another $15 for the 2nd interface cable. I doubt I would have bought it without the specific job to do for the eclipse. But now I have more ideas for using it in the future. Time-lapse movies are fun to make for an event and it is nice to just do this with one of my older D80 bodies and be able to use the regular D7000 for other work.